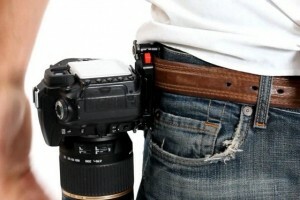 The standard camera strap has been the main means of securing our cameras since the early days of film SLRs. For the most part it has been pretty convenient to have your camera around your neck and within easy reach for when the perfect shot comes up unexpectedly. But for photographs on the move there can be a lot of movement of the camera as you walk, hike or chase down the next great image and excessive movement can put an expensive camera in danger of damage. This is where a photographer from San Francisco had an idea. He invented a device to securely attach your camera while still keeping it within easy reach so no shots are missed. Peter Dering developed the Capture Camera Clip System with three goals in mind; 1) a locking mechanism that ensures total security 2) able to attach to any strap or belt and 3) the device had to as compact as possible. The resulting Capture is a small device that works with the tripod mount on your camera and securely fastens to any strap such as a belt or backpack. Being an individual and not a large corporation with a ton of research and development, marketing and start up costs behind him Peter also got creative with how he is funding the launch of his invention. He turned to Kick Starter, a funding platform for creative projects that allows regular individuals with an idea to source funding to launch that idea. Whether it is music, film, art, technology, design, food, publishing or any other creative fields really, Kick Starter allows people to support creative endeavors through financial funding. Funders are not investing in these projects with hopes of a financial return, instead they are getting something back. In the case of the Capture Camera Clip System, a $50 “backing” gets you one of the first Captures after production starts. For photographers, this would be a great way to support a small inventor and get a photography gadget that would keep your camera secure and within easy reach. I gave the “teaser” last month about my new camera bag. Now that I have been using it for almost a month I’ll give my full assessment and review. But be forewarned, I love, love, love this bag, so I don’t have too much to say on the negative side. Why the Crumpler? I have several camera bags but not one that fit two criteria I really wanted in my next camera bag. 1) I wanted a bag that would hold my iPad but was not designed to hold a laptop as those tend to be much bigger. 2) I wanted an over the shoulder, messenger style bag. I did my online shopping and review reading and there were a few bags that fit the bill. But the Crumpler 7 Million Dollar Home won out based on its styling and the reviews I had read (and watched). 1) The style: It comes in several color combinations but I went with the orange and brown (with a blue interior). I liked the way it looked online and was very satisfied with it in person as well. The messenger bag style of the bag is also great. It does not appear to be a camera bag which can be great for not attracting “hey look at me, I’m carrying $1000s of camera equipment” attention. This style of bag also keeps it right at your side so the camera is in easy reach whenever you need it unlike a back pack camera bag. 3) Construction: I mentioned this bag looks good. As important as that is it doesn’t matter too much if the bag isn’t constructed well. But Crumpler has that covered. The 7 Million Dollar Home is a durable camera bag. Although it is not the bag I would chose for a rugged outdoor adventure, for urban adventures and standard airport to cab to hotel travel it is ideal. The Velcro closures holds things shut tight yet keeps it easy to open when an unexpected shot pops up. The adjustable strap is extra comfortable with its cushioned shoulder strap. Finally, it holds its shape, even when empty. This bag doesn’t collapse flat when empty which makes it easy to pack and return your camera to its secure spot after shooting. 4) Any Cons? I am hard pressed to find something about this bag I don’t like. The Crumpler is not an expensive bag. At $142 it is a bit of an investment, but it is also a great example of the “you get what you pay for” cliche. I think I just turned that con into a pro. 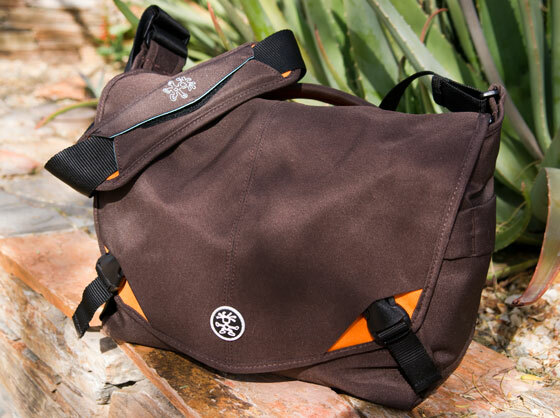 For that price you might consider that the Crumpler is limited to where you will want to use it a negative. As I mentioned this is probably not the bag you want to use for your nature photo shoots out in the woods. It is water resistant, but not water-proof. Bottom line – great style, well constructed, and holds everything you will need. It is pricey and not an all around every-use bag. But if you can save up for it you’ll have a great investment and you can buy a cheaper bag for your outdoor photo shoots. I recently purchased the Sony VG-C90AM Vertical Grip for my Sony Alpha 850 Full Frame DSLR camera and after having used it for a few weeks now I figured I would pass on my review of this battery grip. 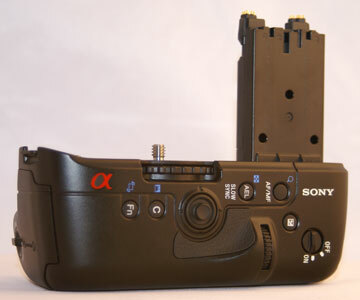 Although most places (including the box it comes in) indicates the VG-C90AM is for the Sony Alpha 900, it is actually compatible with both the 900 and the 850. 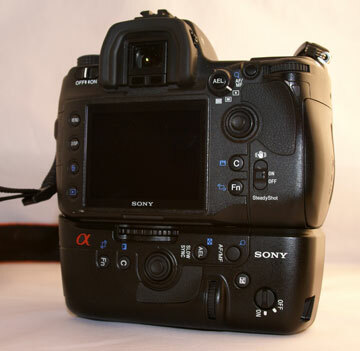 Hold 2 batteries – that is about 1,700 shots according to Sony. I have not had a chance to test that but keep in mind it is dependent on many different factors so your actual battery life may vary. Battery life indicator – on the LCD screen. You will see two battery icons with the combined percent of life left. Gasket sealed controls to keep the dust and moisture out. It does not add significant weight to the camera overall. You will notice the difference, it is not THAT light, but the camera is still very manageable for hand held photography. The design is very comfortable. In fact, I almost find the camera easier to hold with the grip than without because of the additional hand-molded grip. There is a comfortable place for both hands allowing for steady holding of the camera. Double your controls. All of your key controls are now doubled because they are on the camera and the grip. 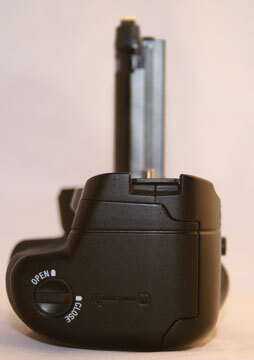 This can come in handy and give you the flexibility to release your shutter of adjust exposure with either hand. You can also turn the controls on the grip off if you prefer to stick to the camera controls only. The alignment of the control on the grip make shooting with the camera vertically much easier. You get yet another option for holding the camera. The addition of the grip really does balance the camera well as Sony claims. It just feels more comfortable and evenly weighted. The battery door has an open/close dial that does just that, allows you to open the door or locks it closed. But it seems a bit flimsy to me and not a secure close. I have not had any problems with it, but I feel I should get a click or a snap really indicating it is shut tight. It is a bit pricey. 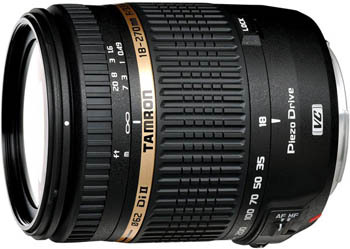 B & H Photo has one of the best prices I found at $259.88, but even still that is a lot for an accessory. However, I have no buyer’s remorse. Secures tightly to the camera using the threaded tripod mount on the bottom and is easily attached with a dial. 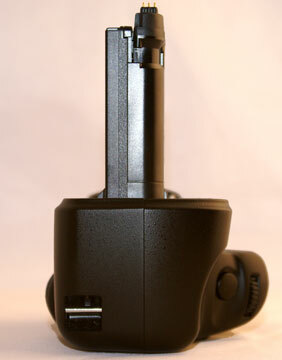 There is also a tripod mount on the bottom of the grip so you do not lose that functionality. For even easier holding you can get an optional strap that attaches to the grip for your hand to slip through. Although it is a bit expensive at around $50 direct from Sony. Like I said, I have no buyer’s remorse for this purchase. The pros far outweigh the cons and the Sony VG-C90AM Vertical Grip has been a very welcome addition to my camera. This grip just feels right. 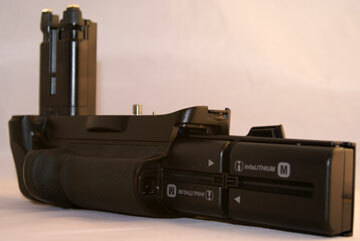 It is comfortable to hold and gives you added versatility for holding and controlling your camera. 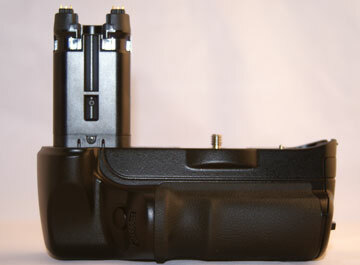 That along with the doubled battery life make the addition of a grip to your Alpha 850 or 900 a great enhancement. 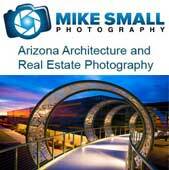 The price is a bit high, but for serious professional or aspiring photographers I feel it is an investment well made. Absolutely necessary? No, but a big “nice to have” that can make the photography job a lot easier. One of my photography best practices is to always carry an extra (fully charged) battery. You have to be a good boy scout to be a good photographer, be prepared. But extra batteries can get pricey. The lithium ion batteries my Sony Alpha 850 DSLR uses are about $50 when you use the Sony brand. That can add up if you are like me and want more than one back up (just in case). So I have tried the “off-brand” or “no-brand” batteries from eBay or similar places on the internet simply because they are a fraction of the cost. To start, these batteries do work. They power the camera and will generally get you through in a pinch. 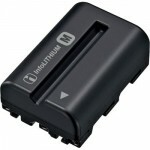 However, in my experience, they drain much quicker than the original Sony batteries. Then after some time they no longer recharge to 100% capacity. It took about a year for my generic batteries to no longer fully recharge. Compare that to the original Sony battery that came with the camera several years ago that still performs as new. The off-brand batteries are not bad. But for me, I learned that when it comes to batteries an extra $20 for an original manufacture’s part is well worth the investment. I do not want to be out shooting someone’s building or trying to capture wildlife and have to worry about the battery in my camera not making it through the day. So my advice, spend a little extra and get the best equipment you can. Since I shoot with a Sony I am only speaking specifically about the Sony NP-FM500H InfoLithium Rechargeable Lithium-Ion Battery that my camera uses. But the good boy scout rule applies to whatever camera you shoot with and I’d be pretty confident in saying original manufacture parts, in the case of batteries are a safe bet for any camera brand. What is a Focus Screen for a DSLR Camera? One problem I have had with my photography, that I have never quite been able to correct no matter how much on concentrate on it before clicking the shutter, is a slightly skewed image. My horizon is just slightly off at an angel. I am not sure if I ever so slightly shift the camera when I click or if I never get it perfectly straight to begin with. But whatever the cause it has resulted in me having to go through the additional steps in PhotoShop to rotate the image and then adjust or crop of the extra white space this causes around the edges. It is not a big deal, but a minor frustration that I was not sure how to correct until recently. I was reading Adrian Schulz’s Architectural Photography (side note: this problem can be particularly noticeable in architectural photography because the horizon and parallel lines in the structures are so important to the overall image) and he mentioned a device called a “grid screen” (or focus screen) – page 37 if you’re interested. In the simplest terms, the focusing screen is the piece in the camera that allows you to view what the lens sees through the view finder. They are often etched with lines or guides that are then visible as an overlay on top of the image as you view it through the view finder. I had known that some cameras had grid lines when you look through the viewfinder to help with composition (think rule of thirds). 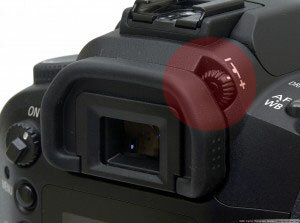 But I did not know that on many DSLR cameras the focusing screen was interchangeable. But a quick search on my favorite camera supply site, B & H Photo, revealed that for my camera, the Sony Alpha 850 DSLR, the focus screen was indeed interchangeable and a grid version was available. 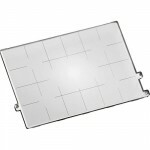 For just over $30 (free shipping too) I ordered the Gridded Type L Focusing Screen. (Note: I have seen these for as much as $56 elsewhere – yikes) This is such a simple solution to the tilted image problem I was having I cannot believe I never came across it before or did not search it out. But once I switched out my standard screen with the gridded screen I instantly had multiple points to reference to make sure everything lined up just right before I click the shutter. Is it a crutch? Maybe, but I look at it more as a tool to help me do my job better -a “work smarter, not harder” thing. I do have a few tips on installing one of these based on my own experience. 1) Steady hands are important. 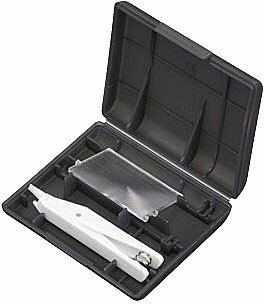 The screen comes as a kit with a storage case and a specially designed tweezers to remove one screen and install the other. 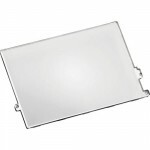 But they are tiny parts and you have to be very careful not to touch the mirror or the sensor in the process. So no coffee immediately before the operation. 2) Make sure you are doing the switch in as clean and dust free of an environment as possible. For one you are working on your camera with the lens off so you wan tot keep dust off your sensor. And two, anything that gets on the focus screen will show in your view finder. I peak from experience here. I had to do this twice because I got a speck of something on the screen and although not on the images it was very obvious through the view finder. 3) Watch the very detailed and well done video below. It is for making the switch in a Sony Alpha 900 or 850 but there are similar videos out there for Canon, Nikon, etc. I think I have become a bit of a collector of camera bags, on a small scale at least. I am up to four bags, but in my defense, each serves a unique purpose. 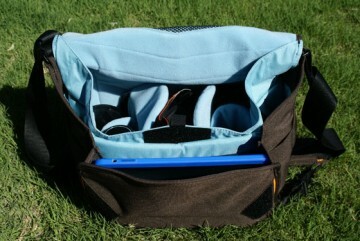 My latest acquisition was the Crumpler 7 Million Dollar Home Camera Messenger Bag . I just got it the other day and have not had an opportunity to do much beyond transfer my equipment into it. My initial thoughts are “very roomy” and love the style. But I will post a full review once I have had a chance to take it on a few shoots and test it out. I’ll see if it lives up to the reasons I selected this particular bag as the next one in my collection and pass on the details of how it measures up. 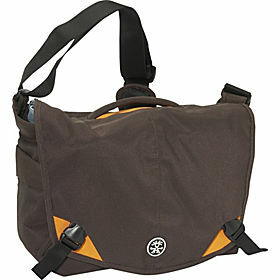 1) Style – I wanted a messenger type bag both for the look and the easy access. 2) Space – I need the room to hold a lot of equipment. 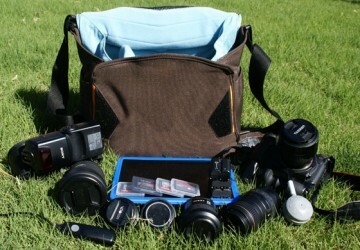 3) Laptop vs iPad – I have a bag big enough for my laptop and one just for the camera. But I wanted something not as big as necessary for a laptop but still big enough for my iPad. 4) Versatility – I wanted a bag with lots of compartments, pockets and way to divide up the space. So I’m going to take this bag out for a test drive this week and will report back my findings. The Eastman Kodak Company introduced Kodachrome color film in 1935. It has been the film used for many iconic photographs over the last 75 years including Steve McCurry’s photograph of an Afghan girl at Nasir Bagh refugee camp in Peshawar, Pakistan, in 1984. When Kodak produced the last rolls of Kodachrome film some were donated to the George Eastman House’s photography museum and one was given to Steve McCurry to shoot. McCurry shot part of the roll in New York City and part in India. NPR has a slide show of some of McCurry’s last Kodachrome images here.